As of 2012 (the most recent data year available), alternative transportation fuels now account for 4.6% of transportation energy consumption. This uptake of alternative fuels, which has been supported by the RLCFRR, has reduced BC’s annual GHG emissions by roughly 900 kt/yr. This reduction makes up 25% of the net reduction in provincial GHG emissions between 2007 and 2012, with other policies and offsets accounting for the rest. 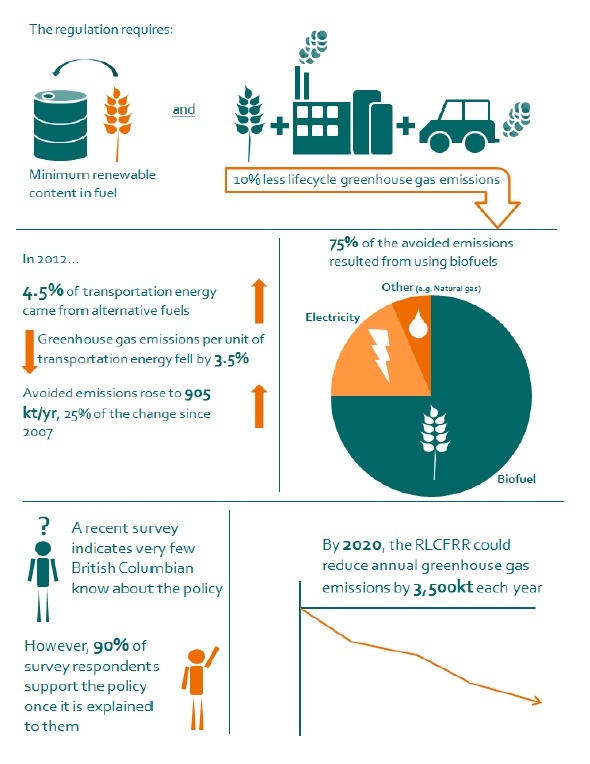 In this research brief, Michael Wolinetz and Dr. Jonn Axsen, of the School of Resource and Environmental Management at Simon Fraser University, summarize the impact of the Renewable and Low Carbon Fuel Requirements Regulation, British Columbia’s clean fuel policy. They also discuss the potential for this regulation to reduce greenhouse gas emissions to the year 2020 and beyond. The RLCFRR at a glance (click for full view).